Learning to recognize and spell your name is an important skill for preschoolers. After all, the letters that make up their name are a very special part of who they are! 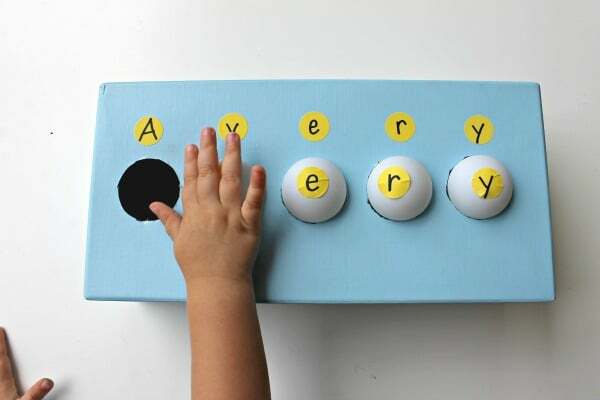 That’s why I like to begin with name recognition when introducing letters to little learners. The excitement and personal ownership of this new found skill make name recognition activities very valuable! We recently set up a hands-on interactive way to practice name spelling and recognition. All it took was some ping pong balls and a few simple materials and the fun and excitement followed. 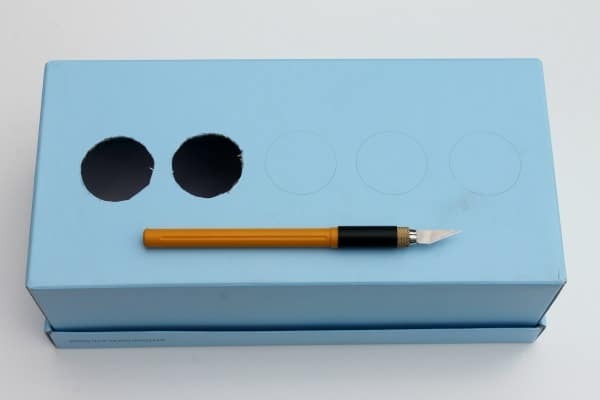 To set up this activity, I began by tracing circles on the bottom of an old shoe box. I grabbed a small lid and tested it out to ensure the ping pong balls would sit on top of the hole, but also be able to be pushed through. I then cut them out with a box cutter. 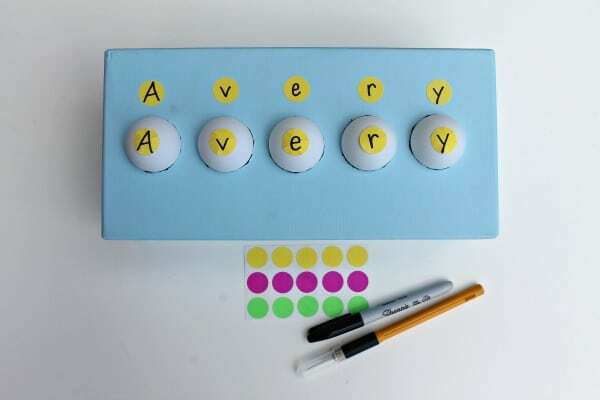 Once the holes were cut, I labeled the ping pong balls and holes with each letter in my little one’s name. This would allow for her to match up the corresponding letters and balls after each round of play. Before we began playing our name recognition game, we recited each letter in her name as I touched each corresponding ping pong ball. On the second round of practicing the name spelling, I demonstrated how the balls could be pushed through the holes. As each ball disappeared, she got more and more excited to try it for herself. In fact, she took over before I could even finish! I would definitely recommend using a shoe box for this activity, as the lid served as a great way to catch the balls and easily repeat the game. She quickly discovered that she could find the balls by separating the box from the lid. In fact, she squealed in excitement on her first discovery! I showed her how to set each ball back on the correct hole which gave her extra practice with her name. She repeated each letter after me as each ball was set back up for another round of play. 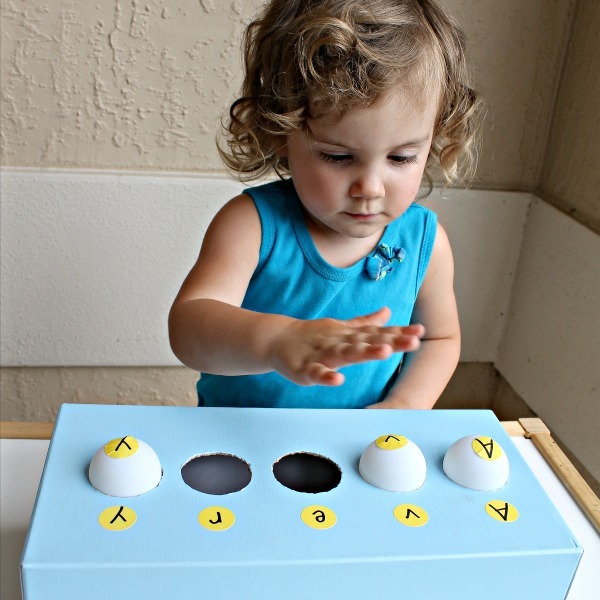 This tactile name game was a huge hit as she wanted to continuously play again and again. 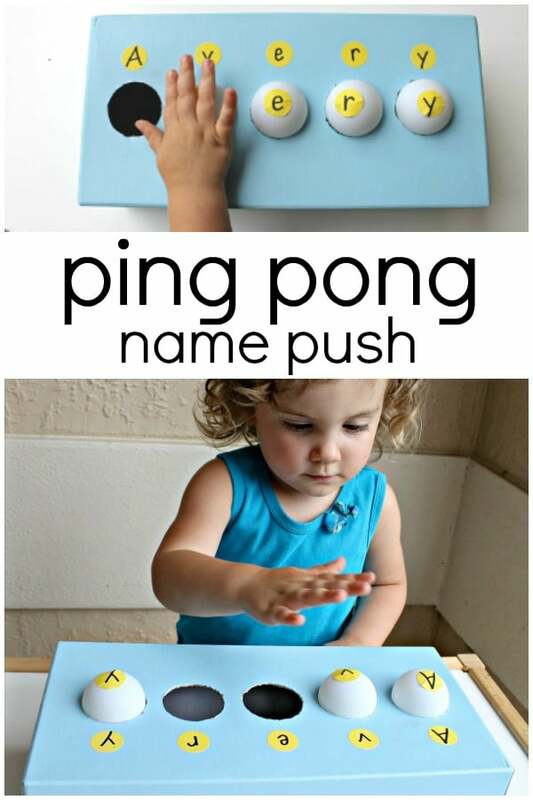 I can see this as being a great way to occupy her little hands while helping her learn her name at the same time too! 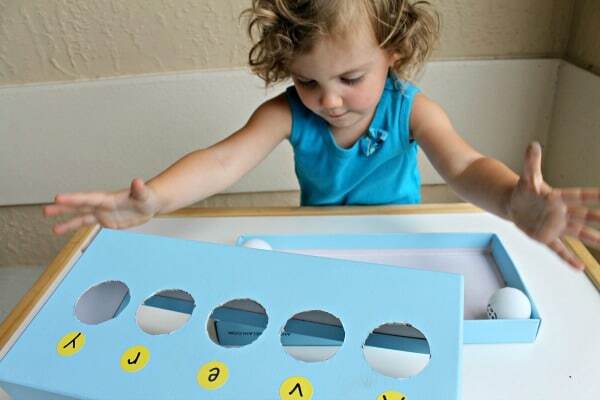 When your little one begins to tire of this activity use the same materials to switch it up a bit and focus on number recognition. Get a full week of playful activity ideas! 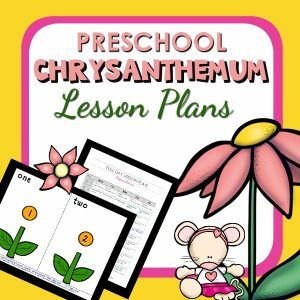 The story Chrysanthemum has a lot to do with names. It makes a wonderful literature study to go along with name activities in the classroom or at home. Continue the learning with our printable lesson plan sets. Each set includes over 30 playful learning activities related to the theme, and we’ve provided different versions for home preschool families and classroom teachers so all activities are geared directly toward your needs.